Dream. Dress. Play. : Make It Monday! 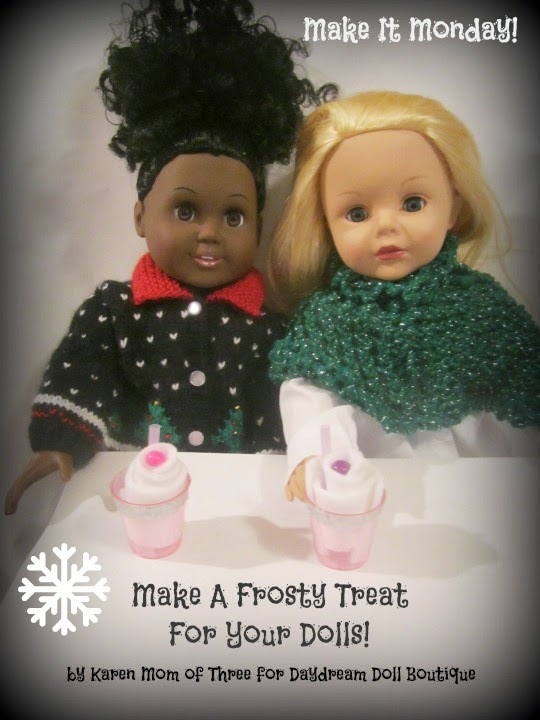 Make A Frosty Treat For Your Dolls! Make It Monday! 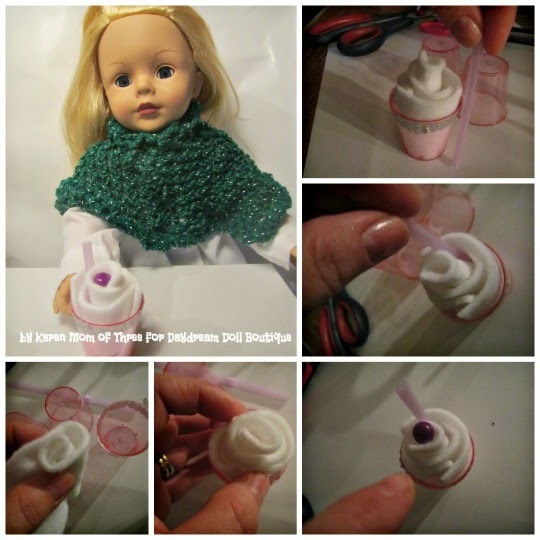 Make A Frosty Treat For Your Dolls! Karen here and today I wanted to share an easy no mess craft you can make your dolls this holiday season. 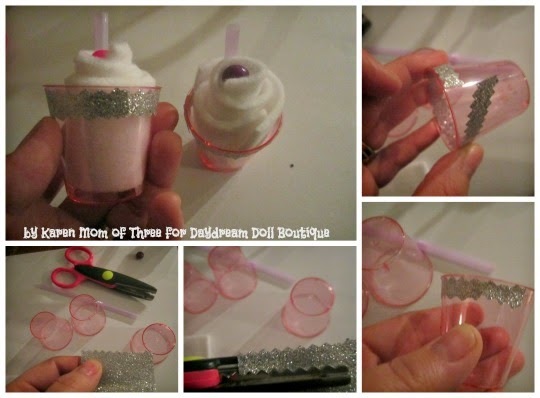 Today's Make It Monday Craft is for a Frosty Treat for your dolls made from items you may already have on hand and it is no mess! Step 1- Assemble all your supplies. Unroll 1/2 of your sparkly tap and use your scissors to cut a pattern at the edge, repeat 1/2 inch down, each of my cups too 3 strips of tape. Start wrapping your tape around the top edge of your cup or where ever you like on your cup the design is up to you. Repeat on as many cups as you plan on making into Frozen Doll Treats. Step 2- Cut Strips of white felt slightly wider then your cup is tall, then roll it together and pull the middle slightly as you place it in the cup, it should be enough felt to hold it's shape. Step 3- Cut a straw about 1 1/2 inches taller then your cup. Insert the straw between one of the layers of felt. Top with a large bead and your Frozen treat is ready to share with your dolls. 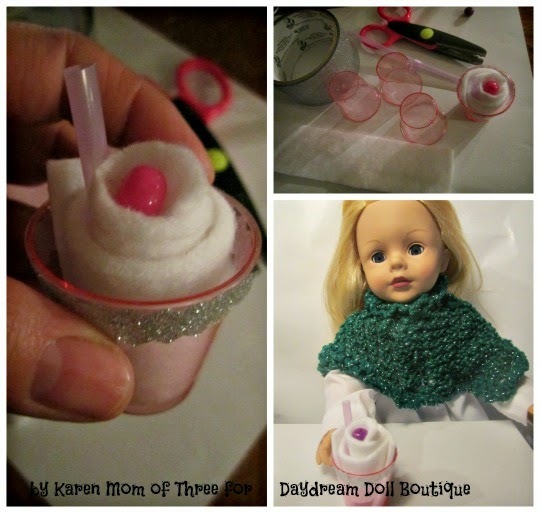 If you wish to make this a more permanent addition to your dolls food and drink collection you can use hot glue to hold the felt together and the straw with bead in place. Make It Monday! Doll Sized Glittler Trees!